An award being presented at the event. Qatar National Tourism Council (QNTC), in collaboration with Auditoire, held a ceremony honouring the exhibitors, government agencies and partners who contributed to the success of the 16th edition of the Doha Jewellery and Watches Exhibition. The exhibition was also the largest with participation from over 500 brands and over 27,000 visits. The event witnessed the participation of 12 young Qatari designers, and a pavilion to display the jewellery of 13 Indian designers celebrating the Qatar-India Year of Culture 2019. The event included the second edition of the DJWE Forum, a charity auction held in partnership with the French Auction House, Artcurial, as well as valuable expert discussion sessions and workshops on the watch and jewellery industry. Khalid al-Jumaili of QNTC, along with Auditoire Middle East vice president Mazen Abed Rabbo honoured the young Qatari designers. Six exhibitors were presented with awards: ‘Best Stand Activation’ was presented to Alfardan Jewellery for its efforts in organising highly relevant events during the show; and Best Cultural Heritage Activity went to Al Majed Jewellery for its distinctive presentation of the craft of traditional Qatari craftsmanship. 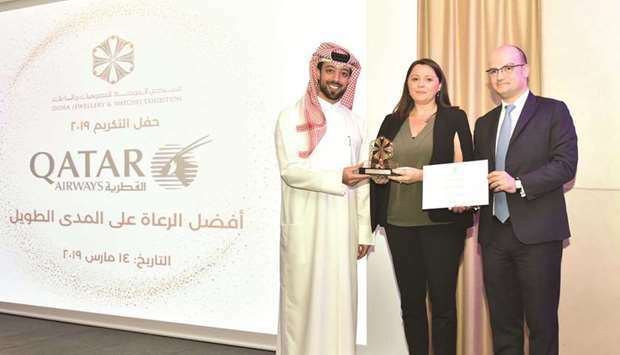 Ali Bin Ali Luxury was awarded ‘Best Stand Design,’ and Amiri Gems for ‘Best Social Media Campaign.’ The award for ‘Best Print Campaign’ went to Fifty One East, and the ‘Best New Participant’ award to Mujawhraty Watches and Jewellery.